This recipe is so easy and so delicious that it’s one of my all-time favorite desserts. Instead of the labor-intensive fresh cherries that are traditional in French clafouti, I’ve streamlined the recipe by using fruit preserves. The end result will not disappoint. Be sure to use top-quality jam that is full of flavor. Clafouti is best served warm, so put it in the oven about an hour before you plan to have dessert. Baking time is 45 minutes; cooling time 15 minutes. 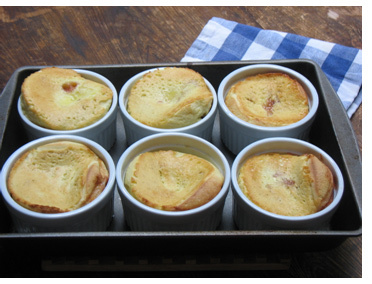 This is a soufflé of sorts, so be sure to show it off when it’s right out of the oven! See in-progress photos below the recipe. In microwave, melt butter in one ramekin. 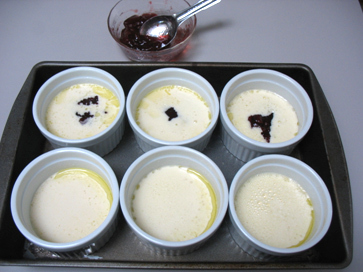 Divide butter among the six ramekins. There should be just 1 to 2 teaspoons in each. Rotate ramekins so butter coats the bottom and sides. Place on a sheet tray or in a 9 x 13” pan. Combine remaining ingredients, except the preserves, in a blender. Blend on low speed until smooth. 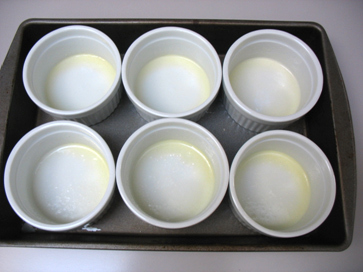 Pour into ramekins, evenly dividing the batter among them. Do not fill more than halfway. Add 1 tablespoon preserves to the center of each. Bake 45 minutes or until puffy and tops are lightly browned. Cool 15 minutes before serving. Serve warm. Batter poured into ramekins; three show jam added. TSG is Two Sisters Gourmet, a line of products that you purchase through home parties, or online. Go to PartyLite.com for more information. You can also use any brand of thick, full-flavored jam or preserves. Please let me know how the recipe turns out for you. Look at you two!! This is great. Somehow, I feel the baton has been passed on. I love all the great ideas and pictures. Our power was out all day yesterday until 6 P.M.. Interestingly, I had asked Chuck to bring home a rotisserie chicken from Whole Foods before I knew I wouldn’t be able to cook dinner. We did quite well with chicken and salad. I usually do the chicken pot pie thing with the remaining chicken. It is Chuck’s favorite. It requires simmering the bones and skin to create a tasty chicken stock. I use that for a great gravy that binds together the veggies and chicken. Any extra stock I freeze in an icecube tray for later uses. Good luck on your latest venture. Thank you Jane! And you were one of the very first out there with a food website in the 1990’s! Loved your Nutritious Gourmet website! Good tip about the tasty broth from the bones. I did that recently with a rotisserie — in fact, that’s what I used in the Cauliflower Leaves soup! But for convenience I called for canned chicken broth in both recipes. I think your stock tip should be added to our “How-to” section which is still in progress. You succeeded in making me hungry! Love the look and it’s so fresh! I’ve been meaning to find a chicken pot pie recipe that is fresh. Can’t wait to try it! Please let us know how you like the skillet pot pie!